Are the any different if I export my artwork in CMYK or RGB for colour proof printing? Which one is better? in CMYK or RGB? are there any different? I save it in JPEG format. I print it with digital printing on art card. I work in the printing industry and you will want to send all art as CMYK to any printer. Metallic colors Neon colors Navy blue Orange Grey In these cases, it is recommended to use PMS spot printing to color correct the limitations of CMYK printing. PMS is also used to ensure accurate brand coloring in design elements such as logos. Black-and-white or monochromatic designs look their best in PMS, as the ink produces much richer variations in tones. Here's a general cheat sheet on when to use RGB, CMYK and Spot colors. It depends on workflow. In the end, RGB files will be converted anyway to CMYK and there is almost limitless combinations of how it can be archived. If proof and final work will be printed in the same printhouse and they do accept RGB files - you shouldn't worry. Result on proof should almost certain look the same as on final work. If you are making proof somewhere else, you should make color conversation by yourself. Just remember to ask your printer color profiles, before you do that. Ask whoever is printing your proof. Typically they'll want CMYK, since that's how it actually prints, but they may want to do the conversion themselves. 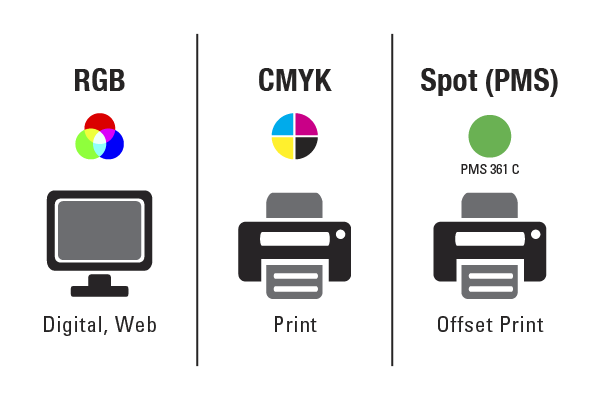 There is big explanation about colors, printers, papers but straight and simple point to your question "digital printing on card" is make your artwork in CMYK mode and export in TIFF format. Not the answer you're looking for? Browse other questions tagged print-design jpg color-reproduction or ask your own question. How do I print black 100 text from Photoshop?